X Its three heads think independently. However, they are friendly and never appear to squabble. X Seine drei Köpfe denken unabhängig voneinander. Dennoch sind sie nett zueinander und streiten nie. X Ses trois têtes sont autonomes. Elles semblent toutefois en harmonie et ne se disputent jamais. X Sus tres cabezas piensan de forma independiente. Sin embargo, son amigas y no suelen discutir nunca. X Ha tre teste che ragionano autonomamente. Ma sono amichevoli e non litigano mai tra di loro. X 3개의 머리는 생각하는 것이 각각 다르지만 사이가 좋아서 싸우지 않는 것 같다. Y It is called “The Walking Jungle.” If a head grows too big, it falls off and becomes an Exeggcute. Y Man nennt es den „Laufenden Dschungel“. Wird ein Kopf zu groß, fällt er ab und wird zu einem Owei. Y On l’appelle « jungle sur pattes ». Si une tête devient trop grosse, elle tombe et produit un Noeunoeuf. Y Se le llama la Selva Andante. Si una cabeza crece demasiado, se cae y forma un Exeggcute. Y Noto come “Giungla in moto”. Se una testa diventa troppo grande, cade e si trasforma in Exeggcute. Y 걸어 다니는 열대 우림이라고 불린다. 크게 자란 머리 중 하나가 땅에 떨어지면 아라리가 된다. 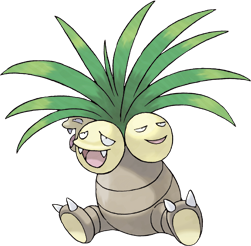 Omega Ruby Exeggutor originally came from the tropics. Its heads steadily grow larger from exposure to strong sunlight. It is said that when the heads fall off, they group together to form Exeggcute. Omega Ruby Kokowei stammt ursprünglich aus den Tropen. Seine Köpfe wachsen stetig, wenn es starkem Sonnenlicht ausgesetzt ist. Wenn seine Köpfe abfallen, bilden sie zusammen ein Owei. Omega Ruby Noadkoko vient des tropiques. À force de vivre sous un soleil ardent, ses têtes ont rapidement grandi. On raconte que lorsque ses têtes tombent, elles se rassemblent et forment un Noeunoeuf. 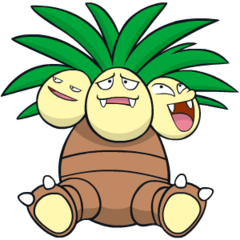 Omega Ruby Exeggutor es originario del trópico. Cuando se expone a un sol intenso, le empiezan a crecer las cabezas. Hay quien dice que, cuando las cabezas caen al suelo, se unen para formar un Exeggcute. Omega Ruby Exeggutor è originario dei tropici. Le teste crescono costantemente se esposte a forte luce solare. Pare che quando le teste cadono, si uniscano per formare un Exeggcute. Omega Ruby 남쪽 나라 태생인 나시의 머리는 강한 햇빛을 잔뜩 받고 점점 자라 땅에 떨어지면 아라리가 된다고 한다. Alpha Sapphire Exeggutor originally came from the tropics. Its heads steadily grow larger from exposure to strong sunlight. It is said that when the heads fall off, they group together to form Exeggcute. Alpha Sapphire Kokowei stammt ursprünglich aus den Tropen. Seine Köpfe wachsen stetig, wenn es starkem Sonnenlicht ausgesetzt ist. Wenn seine Köpfe abfallen, bilden sie zusammen ein Owei. Alpha Sapphire Noadkoko vient des tropiques. À force de vivre sous un soleil ardent, ses têtes ont rapidement grandi. On raconte que lorsque ses têtes tombent, elles se rassemblent et forment un Noeunoeuf. Alpha Sapphire Exeggutor es originario del trópico. Cuando se expone a un sol intenso, le empiezan a crecer las cabezas. Hay quien dice que, cuando las cabezas caen al suelo, se unen para formar un Exeggcute. Alpha Sapphire Exeggutor è originario dei tropici. Le teste crescono costantemente se esposte a forte luce solare. Pare che quando le teste cadono, si uniscano per formare un Exeggcute. Alpha Sapphire 남쪽 나라 태생인 나시의 머리는 강한 햇빛을 잔뜩 받고 점점 자라 땅에 떨어지면 아라리가 된다고 한다. Red Legend has it that on rare occasions, one of its heads will drop off and continue on as an Exeggcute. Blue Legend has it that on rare occasions, one of its heads will drop off and continue on as an Exeggcute. Yellow Its cries are very noisy. This is because each of the 3 heads thinks about whatever it likes. Stadium Each of the fruits is an independently-thinking head. It is said that if one drops off, it becomes an Exeggcute. Gold Its three heads think independently. However, they are friendly and never appear to squabble. Silver If a head drops off, it emits a telepathic call in search of others to form an Exeggcute cluster. Stadium2 Its three heads think independently. However, they are friendly and never appear to squabble. Ruby Exeggutor originally came from the tropics. Its heads steadily grow larger from exposure to strong sunlight. It is said that when the heads fall off, they group together to form Exeggcute. Sapphire EXEGGUTOR originally came from the tropics. Its heads steadily grow larger from exposure to strong sunlight. It is said that when the heads fall off, they group together to form EXEGGCUTE. FireRed It is called "The Walking Tropical Rainforest." Each of the nuts has a face and a will of its own. Emerald Originally from the tropics, EXEGGUTOR's heads grow larger from exposure to strong sunlight. It is said that when the heads fall, they group to form an EXEGGCUTE. Diamond It is called "The Walking Jungle." If a head grows too big, it falls off and becomes an EXEGGCUTE. Pearl It is called "The Walking Jungle." If a head grows too big, it falls off and becomes an EXEGGCUTE. Platinum It is called "The Walking Jungle." If a head grows too big, it falls off and becomes an Exeggcute. Black It is called “The Walking Jungle. If a head grows too big, it falls off and becomes an Exeggcute. White It is called “The Walking Jungle. If a head grows too big, it falls off and becomes an Exeggcute. White 2 It is called “The Walking Jungle.” If a head grows too big, it falls off and becomes an Exeggcute.